Characters on Aaron Sorkin shows, famed for their rapid-fire hallway “walk and talk” scenes, must learn to multitask if they’re going to survive and thrive. 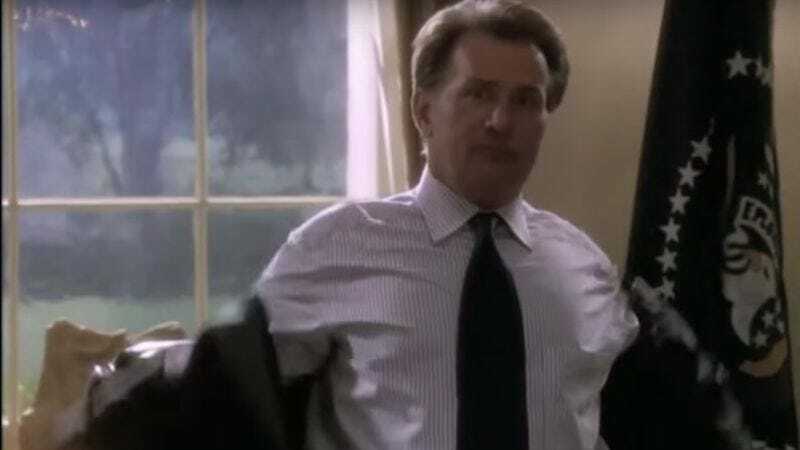 After all, a character like President Jed Bartlet on Sorkin’s The West Wing has a lot to accomplish in those dialogue-heavy, 42-minute episodes. As YouTuber Simon De Little puts it: “Jed is a very busy man who can’t be faffing about putting his jacket on one arm at a time like us normal people.” Luckily, Martin Sheen, the actor who portrayed Bartlet, mastered the art of the jacket flip, a sartorial shortcut immortalized by De Little in a mesmeric new supercut. Watch in awe as Martin Sheen instantly, effortlessly flips his way into his suit jackets again and again, like a superhero donning his costume. There is, in fact, enough jacket flipping on The West Wing to fill up a minute and 45 seconds. And, yes, some of this occurs in hallways, though much of Bartlet’s jacket flipping is confined to the Oval Office. Nostalgic West Wing fans will no doubt enjoy seeing Sheen flip his jacket in the vicinity of such erstwhile costars as Rob Lowe, Allison Janney, and the late, much-missed John Spencer. There is even a flashback in which the young Jed Bartlet is portrayed by Jason Widener but is still doing his signature move, proving that the fictional president was a jacket flipper from way back. If the supercut can be said to have (to use a distasteful turn of phrase) a “money shot,” it arrives at about the 1:24 mark when Sheen almost takes out poor Richard Schiff with an overzealous hallway jacket flip. While Schiff recovers quickly, the moment is nevertheless a reminder that Martin Sheen is a trained, highly paid professional and that West Wing-style jacket flipping is not to be attempted by amateurs.